Who is it for? 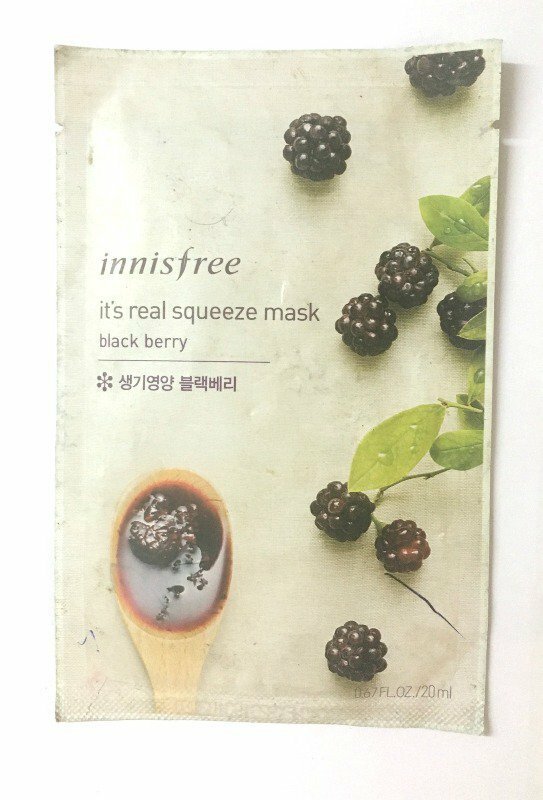 Innisfree My Real Squeeze Mask – Blackberry is for those looking for a cream type sheet mask with nutrients and anti-oxidants to moisturize and firm up the skin. INR 100/- for one sheet mask (20ml). Cleanse and tone the face. Unfold and place the mask on the face while avoiding eye and lip area. Leave on for 10-20 minutes. Remove and pat the skin for further absorption. This sheet mask comes in a sleek white packaging which is pretty decent. The packaging has the picture of berries on it. Detailed instructions can be found at the back of the packet. The fragrance is fruity but not exactly the same as blackberries. The color of the sheet is white and the serum is lotion like. The mask seems to be made of cotton tissue which is wet with a creamy serum which doesn’t really drip. The sheet fits nicely on the contours of the face. The serum is creamy and thus it doesn’t really dry out completely but if the skin is really dry and thirsty then the serum gets absorbed and the sheet dries out a little. This particular sheet mask with the blackberry extracts which is known for anti-oxidant properties. After removing the sheet, the serum leaves a sticky feel on the face. I have combination skin type and when I removed the mask I felt that my skin couldn’t absorb a lot of the creamy serum. So I wiped my face and slept. In the morning I just splashed my face with lukewarm water. I felt that the mask hydrated the skin while making it appear supple and glowy. However, I feel that because the serum is lotion like it is ideal for winters and may feel a bit heavy in the summer months. I feel that people with acne prone skin should wipe off the excess serum or splash the face with water after a while of removing the mask otherwise the clogged pores may cause breakouts. The mask claims to hydrate the skin and so it does but just for that sole purpose using a sheet mask is not the best option. It doesn’t have a ‘must have’ value to it. All in all, this mask is pretty average in comparison to other masks from the same range. The creamy serum can be a little too much for combination/oily skin type and if not wiped or rinsed with water, the clogged pores may lead to breakouts. No, as I don’t think that buying a sheet mask just for moisturizing the skin is value for money. Innisfree My Real Squeeze Mask Broccoli – Is this worth Your Money? Innisfree My Real Squeeze Mask Lime – Refreshing? Innisfree My Real Squeeze Mask Fig -Worth it? Innisfree My Real Squeeze Mask Tomato – Is it Worth Buying?